Every year, Drum Corps International's Individual & Ensemble Competition (I&E) showcases some of the finest performances of drum corps musicians and color guard members. This is where those who have perfected solo and ensemble pieces during their spare time outside of extensive corps rehearsal schedules will exhibit their individual and small group talents. In addition to traditional brass, percussion, and visual categories, I&E also offers performance opportunities for woodwind players whose primary instruments are not incorporated in normal DCI competitions. For the very first time, this year's I&E Competition will take place earlier than its usual place on the summer tour schedule during the week of the World Championships. World Class corps members will have the chance to compete over two days coinciding with the DCI Southwestern event in San Antonio on Saturday, July 24 and Sunday, July 25, while Open Class corps will have their own I&E Competition taking place in Michigan City, Ind. on Wednesday, Aug. 11, the day following the Open Class Quarterfinals. View photos from the 2009 I&E Competition. View 2009 I&E Competition results. 2010 will be the 20th anniversary of S.O.M.E. (Sponsors of Musical Enrichment) sponsoring the Individual & Ensemble Competition. Established in 1978 as a nonprofit corporation in San Joaquin County, Calif., S.O.M.E. supports local youth organizations and performing arts projects. It also sponsors the annual Jim Ott Scholarship—named in memory of the legendary drum corps brass arranger and instructor—which is awarded to corps members who are pursuing music education degrees. For the second year, Mid-Atlantic Arts Network for Youth (MANY) steps up as an additional sponsor of the I&E Competition. 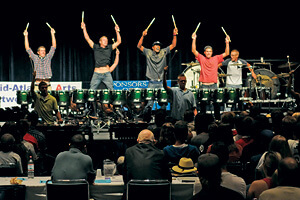 MANY works to promote drum corps activities in the greater Washington, D.C., area, providing young people with the resources necessary to participate in a DCI corps.